Isn't it beautiful? For a while now, I've been wanting to learn how to play the violin. 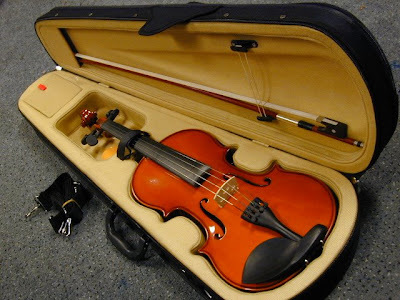 In high school, I tinkered around with the cello (which I love), but the violin seemed like the best choice for two reasons: 1) you can get one for pretty darn cheap and 2) i love folk music, which features the fiddle. Knowing that I now have some time off to play around with it, my husband decided to order one from ebay at a good price. What a great idea! Forgive me for this blog.